Many new teachers are inspired by the social justice and multicultural theory presented in some teacher education programs, but need to see examples of it in action. Some people believe that younger students are not capable of discussing difficult or controversial topics. This site counters that notion by showing teachers and students engaged in social action on complex topics. It provides a multimedia space to see social justice projects in action. This site features the work of Dr. Bree Picower and her students. Dr. Bree Picower is an Associate Professor at Montclair State University in the College of Education and Human Development. She was awarded the Scholar Activist of 2013 by the Critical Educators for Social Justice SIG of the American Educational Research Association. Her forthcoming co-edited book with Rita Kohli, Confronting Racism in Teacher Education: Counternarratives of Critical Practice examines patterns of institutional racism by amplifying the voices of non-dominant teacher educators. Her last book, a co-edited collection of essays with Edwin Mayorga called What’s Race Got To Do With It? How current school reform maintains racial and economic inequality is available from Peter Lang Publishers. She is also the author of Practice What You Teach: Social Justice Education in the Classroom and the Streets explores a developmental continuum toward teacher activism. Bree works to create spaces for educators to sharpen their political analysis and act for educational justice. 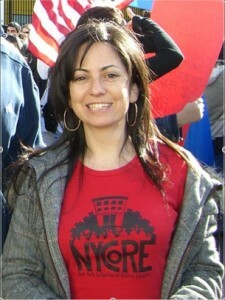 She has taught in public elementary schools in Oakland, California and New York City. This site features blogs from Bree’s students as they engage in teaching about social issues and engage their students in social action. It also includes an extensive annotated bibliography (click children’s literature) maintained by her students of social justice books for elementary students. The Newark Montclair Urban Teacher Residency Program (NMUTR) is an innovative apprenticeship-based teacher education program. Students in initial certification and dual degree/ dual cert programs contributed unit plans to the SJE Units section. The New York University Social Justice Critical Inquiry Project was a small group of teachers committed to teaching for social justice, even in their first years of teaching. Facilitated by Bree Picower, the group met biweekly for 3 years to support each other in negotiating the challenges of beginning to teach.